When the potential of intelligent alien civilisations comes up in conversation, it’s usually about the search. How will we find them? Where are they? Are they there at all? What actions should we take if – or when – we find them, or they find us? Hawking’s warning comes in a new online film called Stephen Hawking’s Favourite Places, which shows the famed scientist in a CGI spacecraft called the SS Hawkingexploring his favourite places in the Universe. "As I grow older I am more convinced than ever that we are not alone. After a lifetime of wondering, I am helping to lead a new global effort to find out, the Breakthrough Listen project will scan the nearest million stars for signs of life, but I know just the place to start looking. One day we might receive a signal from a planet like Gliese 832c, but we should be wary of answering back." Hawking says in the film while exploring Gliese 832c, a planet that lies 16 light-years away and might foster alien life. Recently, the project announced that it would be turning its attention to the hypothetical 'alien megastructure' that some think is causing a star known as KIC 8462852 to oddly dim off and on. A more reasonable hypothesis is that the erratic dimming is caused by 'interstellar junk' or a comet swarm, but no one really knows what’s going on there yet. Hawking often uses the example of Columbus’ expedition to the America’s to describe what could happen if an advanced civilisation gets word of our existence, saying that that initial meeting "didn’t turn out so well". 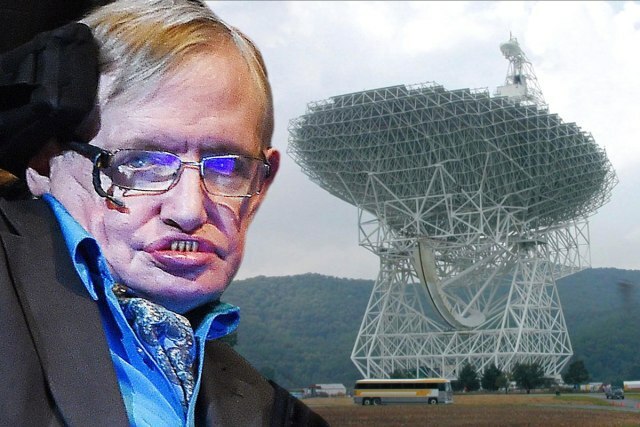 Hawking’s warning is rooted in the idea that an alien civilisation, especially one that can pick up our signals and understand where they’re coming from, has the potential to be billions of years more advanced than us, making us an easy target to overthrow or invade. Reaching out to the Universe isn’t the only area of scientific pursuit that Hawking says is risky.A few weeks ago, at a lecture at the University of Cambridge, Hawking said artificial intelligence might prove to be "either the best, or the worst thing, ever to happen to humanity", a feeling that other experts and leaders – such as Elon Musk – have agreed with. "[Artificial intelligence] would take off on its own, and re-design itself at an ever increasing rate," he told Rory Cellan-Jones at the BBC. "Humans, who are limited by slow biological evolution, couldn't compete, and would be superseded." While all of these warnings might seem a bit much, it’s important for us to think about them before we have to. As the saying goes, it’s better to be safe than sorry, especially when world-dominating aliens or AI robots are involved. Besides offering an ominous warning, though, the new 25-minute film sees Hawking explore other incredible spots in the Universe, such as Sagittarius A* – a supermassive black hole – and our Solar System’s very own Saturn, a planet that Hawking is fascinated with.